Winning 7 Tour de France titles in a row, Lance Armstrong is now a record breaking biker that astounded people around the world. Is that too much to take in? In the article “Lance Armstrong Admits Drug Use, Bullying Tactics” by Lance Pugmire, the world is shocked to know that the rider is actually using drugs and blood transfusions to achieve his titles. He said without the performance-enhancing drugs he wouldn’t be able to win. While interviewing with Oprah Winfrey, he admits the use of energy boosting substance EPO, testosterone, HGH, cortisone and employing blood-doping practices and transfusions. The past few years some people has reported him of drug use, but Lance defiantly denied them and sued them for their accusations. Now he wants to make amends for all the people he sued and all the lives he ruined. The purpose of this article is to show us what Lance Armstrong did and also show that cheating is possible in every possible way and how it affects ones life. Take all the people that accused him for example, now their lives are ruined because of their loss of a job and Lance Armstrong is in guilt in what he did. Cheating can affect a lot of people in many different ways. It may feel good for a few days but eventually you’ll be feeling the guilt. I think that to be knowing that such a famous and impressive person can also have big flaws opened our eyes and give us unexpected outcomes. Lance Armstrong may have cheated, but at least he had the guts to come to a talk show and make a world-wide confession. Sure, he did it late, but he did it bravely. When we do soemthing wrong, stepping up is always the best choice. and allowed me to ‘accidentally’ push him down the bridge. A wave laps up a cup of Styrofoam, a seabird nearby flies to it and take a bite off of it. This results in the Styrofoam poisoning the seabird and ultimately kills it. 10 year old Mia Hansen is well aware of the pollution and all the Styrofoam drifting in the ocean. And she will do everything to lessen the rates of a Styrofoam cup ending up in the ocean. In the article, “Fifth-Grader’s Petition Prompts Jamba Juice to Ditch Styrofoam.” by Stephen Messenger Mia is one child that created a poll on Change.org that says “Styrofoam takes so long to break down into the Earth. In the ocean, several animals think that this product is food, so when they go to eat it, the styrofoam can kill them!” A lot of people supported this idea and this caught Jamba Juice’s attention. In three weeks their response came out saying they will stop using Styrofoam by the end of 2013. By using sheer determination and heart a 5th grader did what’s right that most adults couldn’t or wouldn’t do. The purpose is to obviously show us what humans are capable of. “It made me feel like anyone of any age in any country can really make a difference in the world.” Says Mia. And she is right, what we are lacking is the will to act and determination. Mia is special because she truly cared when others wouldn’t, she acted when others would’ve just give up, and she succeeded because she kept at it. One of the many examples of our capabilities. Posted on January 20, 2013 Categories Humanities, Middle SchoolTags AoW, richertLeave a comment on DITCH STYROFOAM! Legend of Zelda Gameplay Changed! Play the game, don’t let the game play you. In almost every single video game we play the protagonist is male, male, and more male. Rarely we see a female jumping on platforms, gunning down aliens, or slashin’ and hackin’ the heads off monsters or whatsoever. Well, Mike Hoye, a father of three and a half year old girl Maya just changed the gameplay of Legend of Zelda for his daughter. 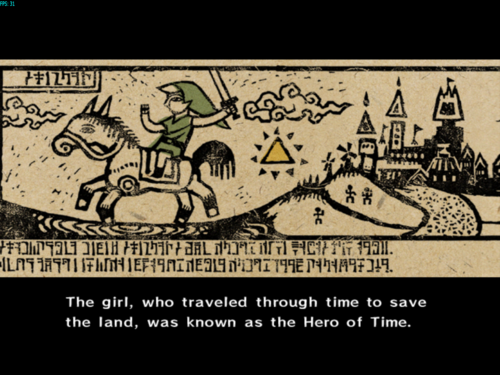 In the article, “Dad hacks Zelda video game to change boy superhero into girl for his daughter” by Jordana Divon, is about Mike Hoye, a gamer and a small business owner that changed all the dialogues in the game The Legend of Zelda to indicate that the main character, Link, is a girl instead of a boy. Mike often read the dialogues in the game for his girl since she can’t read, but changing the dialogue in his mind as he goes can be challenging, that’s why he just put the dialogues he wants as part of the game. “I don’t want my daughter to grow up thinking that girls don’t get to be the hero and save their little brothers.” says Mike. Even though the point of this article isn’t clear, we can imply that the author wants us to know that there are many forms of encouraging children, normally we would just talk to the child after dinner or give them a inspirational book to read. They are effective in some ways but eventually the children gets tired of the books, but Mike Hoye’s method is turning out to be a really special and possibly effective one. Even though people are saying video games can teach bad things, Mike uses his way to prove these people wrong. Mike Hoye used a reliable and creative way to set Maya on a path where she can believe in herself and eventually becoming and natural leader just by playing a game. Using the interest of Maya he made her being able to grow up thinking that girls are able to become heroes and are as much eligible as boys. This haves me thinking that as a part of a community, we should find ways to guide other peoples path and have them believe in themselves. Posted on January 13, 2013 Categories Humanities, Middle SchoolTags AoW, richertLeave a comment on Legend of Zelda Gameplay Changed!